This article is about the current airport, open since 1999. For the airport previously serving Austin, Texas, see Robert Mueller Municipal Airport. 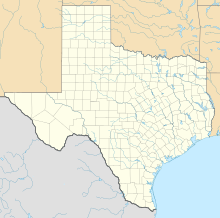 Austin–Bergstrom International Airport or ABIA (IATA: AUS, ICAO: KAUS, FAA LID: AUS, formerly BSM) is a Class C international airport located in Austin, Texas, United States (the capital of Texas), and serving the Greater Austin metropolitan area. Located about 5 miles (8 km) southeast of Downtown Austin, it covers 4,242 acres (1,717 ha) and has two runways and three helipads. It is on the site of what was Bergstrom Air Force Base. The airport and Air Force base were named after Captain John August Earl Bergstrom, an officer who served with the 19th Bombardment Group. The airport replaced Robert Mueller Municipal Airport as Austin's main airport. The airport is the fourth busiest in Texas after Dallas/Fort Worth, Dallas–Love and Houston–Intercontinental. Currently, there are over 250 daily arrivals and 260 daily departures on the typical weekday to 76 destinations in the U.S., Canada, Mexico, the Caribbean, and Europe. Austin–Bergstrom International Airport is located on the old site of Bergstrom Air Force Base. Austin–Bergstrom replaced Austin's Robert Mueller Municipal Airport, opening to the public on May 23, 1999. The city began considering options for a new airport as early as 1971, when the Federal Aviation Administration proposed that Austin and San Antonio build a joint regional airport. That idea was rejected, as few Austinites supported driving halfway to San Antonio on Interstate 35 to catch a flight. Afterwards, the city submitted a proposal to the United States Air Force for joint use of Bergstrom Air Force Base in 1976. The Air Force rejected the proposal in 1978 as being too disruptive to its operations. In the 1980s, neighborhoods around Mueller applied enough political pressure to force the city council to choose a site for a new airport from locations under consideration. In November 1987, voters approved a referendum designating a site near Manor. The city began acquiring the land, but faced lawsuits from the Sierra Club and others concerned about the Manor location and its potential environmental impact. The plans to construct a new airport at the Manor location were abandoned in 1991 when the Base Realignment and Closure Commission selected Bergstrom AFB for closure, and gave the nod to the city for the land and runways to be converted for use as a civilian airport. The USAF also agreed not to demolish the existing facilities, including the nearly-pristine main runway. The city council decided to abandon the original plan to build the new airport near Manor, and resolved instead to move the airport to the Bergstrom site. The City of Austin hired John Almond—a civil engineer who had recently led the airport design team for the new airport expansion in San Jose, California—as Project Director for the new $585 million airport in Austin and to put together a team of engineers and contractors to accomplish the task. The issue of a $400 million bond referendum for a new airport owned and operated by the city was put to a public vote in May 1993 with a campaign managed by local public affairs consultant Don Martin and then-Mayor Bruce Todd and was approved by 63% of the vote. Groundbreaking for the new airport began in November 1994. Bergstom AFB's main runway, 17R/35L, was kept intact along with most of its taxiways, as its high weight rating and long length would facilitate eventual service by large long-range airliners while reducing construction costs. Bergstom's original secondary runway, 17L/35R, was closed and partially demolished to allow new sections of taxiway to directly connect the main runway to the terminal complex. A replacement 9,000-foot 17L/35R was built to the east of the terminal site, along with a general aviation complex to the inside of its southern half. Most of the existing military buildings including the original control tower were demolished and cleared to make way for the new terminal and substantial parking facilities, though a hangar complex and parking tarmac to the south was retained, along with a section of tarmac to the northeast of the primary runway which became the foundation for ABIA's freight terminal. A few other existing jet bridges were converted to access roads for ground vehicles, while the family housing area to the northwest would be leveled but some of the roads kept for a Texas Department of Transportation service facility. A large complex of Travis County facilities, including the county correctional facility and sheriff's training academy, already existed just off of the original base; these facilities were left untouched. Bergstrom had the designator BSM until Mueller's final closure in 1999, when it took Mueller's IATA code of AUS. Initial issues with flight scheduling and routing led to proposed plans to keep Mueller operating in parallel with Bergstrom for a few weeks, but residents near Mueller blocked such efforts by appealing to the FAA, who refused to delay the transfer of the AUS LID or to issue a new airport code for Mueller. Approaching Austin Bergstrom International Airport. The upper-level roadway is for departures, while the lower-level roadway is for arrivals. 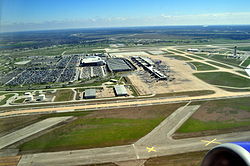 Austin–Bergstrom International Airport opened to the public on May 23, 1999 with a 12,250 feet (3,730 m) runway, among the nation's longest commercial runways. The Barbara Jordan passenger terminal was originally conceived as an 18-gate terminal facility with a footprint of a bit more than 500,000 square feet (46,000 m2). However, ABIA was expanded during construction to have 24 contact gates with jet bridges (named Gate 2-Gate 25) and 1 gate without a jet bridge (named Gate 1) for a total footprint of 660,000 sqft. The opening of the airport coincided with a considerable number of nonstop flights being operated into Austin from the Dallas Metroplex, as American Airlines had decided to compete with Southwest Airlines' scheduled service between Dallas Love Field (DAL) and Austin in addition to American and Delta Air Lines service between Dallas-Fort Worth International Airport (DFW) and AUS. At the time, there were forty-two (42) nonstop flights every weekday being operated with mainline jet aircraft from the two primary airports located in the Dallas/Fort Worth metroplex to Austin. By contrast, this same OAG lists a combined total of twenty-four (24) nonstop flights every weekday at this time from the two primary airports serving the Houston area, Hobby Airport (HOU) and Intercontinental Airport (IAH), to Austin. These schedules have evolved over time as Austin's population and economic importance has grown and airlines have introduced nonstop flights directly out of Austin instead of routing passengers through existing hubs in Dallas and Houston as they had done before. The airport's first scheduled transatlantic service, to London–Heathrow, was inaugurated by British Airways in March 2014. Additional transatlantic service has been added since then, with Norwegian Air Shuttle launching seasonal service to London–Gatwick in 2018. Lufthansa has announced service to Frankfurt that will begin on May 3, 2019. Austin–Bergstrom International Airport is currently in the final stages of preparing their 2040 master plan. As ABIA continues to experience rapid growth, future plans call for, amongst other things, a new satellite concourse with 32 gates, a new 10,000 ft runway and corresponding taxiway improvements and a new head-terminal for expanded check-in, security, and pick-up/drop-off where the existing Garage 1 is. Runway 17R/35L, to the west of the terminal, is the original runway built and used by the Air Force. The 12,250-foot-long (3,730 m) runway was reconditioned when Austin–Bergstrom was built. The 23-inch-deep (580 mm) concrete runway is dedicated to former President Lyndon B. Johnson. Runway 17L/35R is a new 9,000 foot (2,700 m) runway on the east side of the terminal and parallel with runway 17R/35L. This runway is dedicated to former Congressman J. J. "Jake" Pickle. This runway contains a Category IIIB instrument landing system, the first in Austin. The runways are watched over by a 227 foot tall air traffic control tower. The tower formerly used by the Air Force has been demolished. The Barbara Jordan Terminal was designed by the Austin firm of Page Southerland Page with associate architect Gensler under contract to the New Airport Project Team, with lead architect University of Texas at Austin Architecture professor Larry Speck. The terminal is 660,000 square feet (61,000 m2) with a total of 25 gates, two of which can be used for wide-body aircraft. There are several restaurants and food concessions inside the terminal, all but two of which are located inside the secured gate areas of the terminal. Both American and United Airlines operate lounges for members of their executive lounge programs. The terminal also has a live music stage on which local bands perform in keeping with the spirit of Austin's proclamation as "The Live Music Capital of the World." The terminal's first expansion project was completed in the summer of 2015. It added an enlarged customs and immigration facility on the arrivals level capable of processing more than 600 passengers per hour, two domestic baggage claim belts, and an enlarged security checkpoint on the ticketing level. In mid-2016, work began on a new 88,000 square feet (8,200 m2) pier on the east side of the terminal that will increase the total number of gates from 25 to 34. These gates will be spaced farther apart, and two gates will be equipped with dual jetbridges in order to accommodate additional flights operated by larger aircraft. The number of flexible-use gates that can accommodate both international and domestic flights will increase from two to six. The extension will also include an 8,926 square foot Delta Sky Club with an outdoor sky deck. The terminal is connected to a 3,000 space parking garage used for public parking. A consolidated rental car facility that houses counter, pick up, drop off, service and cleaning facilities is connected via walkway to the terminal and parking garage. The addition of the rental car facility, completed in October 2015, allowed the 900 parking spaces previously used for rental cars on the top floor of the parking garage to be converted to additional close-in short-term parking. A secondary terminal known as the South Terminal Austin is used by ultra low-cost carriers Allegiant Airlines, Frontier Airlines, and VIA Air. The South Terminal is accessed from a separate entrance on the south side of the airport perimeter from Burleson Road; it cannot be accessed from either the main airport entrance from SH 71 or the Barbara Jordan terminal except by completely exiting the airport grounds. A shuttle runs between the two terminals. The facility has a retro look and three passenger gates without airbridges—passengers walk under a covered walkway to board the aircraft by stairs. The second terminal was originally commissioned as a joint venture with the Mexican-based low-cost airline VivaAerobus, which commenced service from Austin on May 1, 2008. The 30,000 square foot building, which was part of the original Air Force Base facilities, was renovated to meet the standards of a no-frills carrier. VivaAerobus's service was short-lived due to an epidemic of swine flu in Mexico in the spring of 2009 that resulted in high cancellation and no-show rates among leisure travelers, the airline's target demographic. Facing steep losses, the carrier terminated all service to the United States on June 1, 2009. The South Terminal's operator announced the closure of the facility at the same time. In August 2015, the Austin City Council authorized a 30-year lease on the facility to LoneStar Airport Holdings, LLC, which proposed relocating the ultra-low-cost carriers Allegiant Airlines and Frontier Airlines from the Barbara Jordan Terminal. Both carriers had expressed interest in expanding service to Austin but faced physical constraints as the main terminal neared capacity during peak hours. The South Terminal underwent a $12 million renovation with a retro theme in the fall of 2016. Allegiant Airlines's transfer from the Barbara Jordan terminal on April 13, 2017 marked the reopening of the South Terminal. Frontier, with recent expansion at ABIA, did not immediately relocate from the main terminal. But on November 15, 2018 the airline officially moved all operations to the South Terminal and remains there today. (a) Includes passenger totals at Robert Mueller Municipal Airport for January-May 1999. ^ a b FAA Airport Master Record for AUS (Form 5010 PDF). Federal Aviation Administration. effective July 29, 2010. ^ "Austin International Airport Total Operations and Traffic". February 1, 2018. Retrieved February 1, 2018. ^ "Bergstrom Air Force Base: A 52-Year History of Service". Austin–Bergstrom International Airport. Retrieved August 28, 2011. ^ "Austin Destinations". Retrieved February 8, 2018. ^ "Airport site stirs controversy". The Daily Texan. January 15, 1985. ^ a b "History of the Airport". Austin–Bergstrom International Airport. City of Austin. Retrieved June 4, 2013. ^ "Austin–Bergstrom International Airport to take off today". Lubbock Online. Lubbock Avalanche-Journal. Associated Press. May 23, 1999. Retrieved June 4, 2013. ^ "Norwegian announces nonstop service from Austin to London Gatwick Airport". Austin–Bergstrom International Airport. City of Austin. Retrieved 6 July 2017. ^ "Lufthansa announces nonstop service from Austin to Frankfurt". Retrieved 5 October 2018. ^ "PROPOSED ALTERNATIVES - ABIA Master Plan". Retrieved 30 June 2018. ^ a b "austintexas.gov". Retrieved July 19, 2017. ^ "Milestones: Austin–Bergstrom International Airport". Austin City Connection. Retrieved October 5, 2007. ^ Larry Speck UTopia Profile Archived June 17, 2006, at the Wayback Machine The University of Texas. Accessed June 23, 2006. ^ "More Gates, More Parking, More Amenities at Austin Airport". Austin American Statesman. Retrieved November 8, 2017. ^ "Delta Sky Club". Retrieved February 9, 2018. ^ VivaAerobus to cease operations out of Austin–Bergstrom Archived May 19, 2009, at the Wayback Machine Accessed May 16, 2009. ^ "LoneStar shows South Terminal renovation plans". Austin–Bergstrom International Airport. AustinTexas.gov. Retrieved 14 July 2016. ^ "Airlines and Flights". Austin–Bergstrom International Airport. AustinTexas.gov. Retrieved 11 October 2018. ^ "Flight Schedule". Retrieved April 6, 2017. ^ a b "Flight Schedules". Retrieved April 6, 2017. ^ "Air Canada S19 Toronto – US service expansions". Routes Online. March 2017. Retrieved March 27, 2019. ^ "Flight timetable". Retrieved April 6, 2017. ^ "Flight schedules and notifications". Retrieved May 3, 2017. ^ "Flight schedules and notifications". Retrieved April 6, 2017. ^ "Timetables". Retrieved April 6, 2017. ^ "Kayak Direct Flight List". Retrieved December 30, 2018. ^ "JetBlue Airlines Timetable". Retrieved April 6, 2017. ^ "Lufthansa Group optimizes hub management of the net-work airlines and prepares for moderate growth in summer 2019". Retrieved 27 September 2018. ^ "Timetable - Lufthansa United States". Retrieved 27 September 2018. ^ "Norwegian Air Shuttle Destinations". Retrieved July 5, 2017. ^ "Check Flight Schedules". Retrieved April 6, 2017. ^ "More Nonstops from Austin! Spirit Airlines Begins Flying from Texas' Capital City, Adds Another Nonstop Route - NASDAQ". Retrieved February 16, 2019. ^ "Spirit Airlines adds Austin service from Feb 2019". Routes Online. November 2018. Retrieved November 22, 2018. ^ "Spirit Airlines Route Map". Retrieved 14 November 2018. ^ "Flights announced from Gulfport MS to Austin TX, Ft. Myers FL | Biloxi Sun Herald". Sunherald.com. 2018-10-23. Retrieved 2019-02-28. ^ "Sun Country Airlines". Retrieved April 6, 2017. ^ a b "Timetable". Retrieved April 6, 2017. ^ "WestJet: Austin, Portland flights will begin in 2019". Usatoday.com. Retrieved 2019-02-28. ^ "Flight schedules". Retrieved 28 January 2019. ^ a b "DHL Flightaware". Retrieved October 20, 2017. ^ "RITA – BTS – Transtats". BTS. Retrieved March 17, 2019. ^ "December 2018 Passenger, Cargo Traffic at Austin-Bergstrom". Retrieved 5 February 2019. ^ "Airport Activity Reports - Passenger & Air Cargo Traffic". Retrieved 26 July 2018. ^ "Austin Airport Annual Traffic Report". Retrieved 24 February 2019.